Heritage 2020 a sector-wide initiative to sustain and promote the historic environment of England, is seeking ‘Expressions of Interest’ in a pro bono update on statutory England’s heritage-related duties of England’s local authorities, closing 5 July. ‘With your help we can muster the evidence and the cogent arguments that can turn this issue around. Please be in touch’. Many organisations within the heritage sector are concerned at the loss of heritage skills and expertise working within or advising Local Authorities. 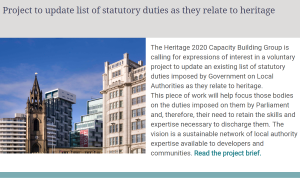 The Heritage 2020 Capacity Building working group seeks expressions of interest for a project to update an existing list of statutory services imposed by Government on Local Authorities, as they relate directly or indirectly to heritage. This piece of work will help focus those bodies on the duties imposed on them by Parliament and, therefore, their need to retain the skills and expertise necessary to successfully discharge them. The vision is a sustainable network of local authority expertise available to developers and communities. There is no fee for this work. Expressions of interest are invited by 17.00 on 5th July to heritage2020@theheritagealliance.org.uk.